Yesterday morning I wrote out a nice detailed to-do list that included items like clean off the top of my desk, update my Quickbooks file for Grote Ink, move furniture, buy paint, that sort of thing. No where on the list did it say videotape birds. 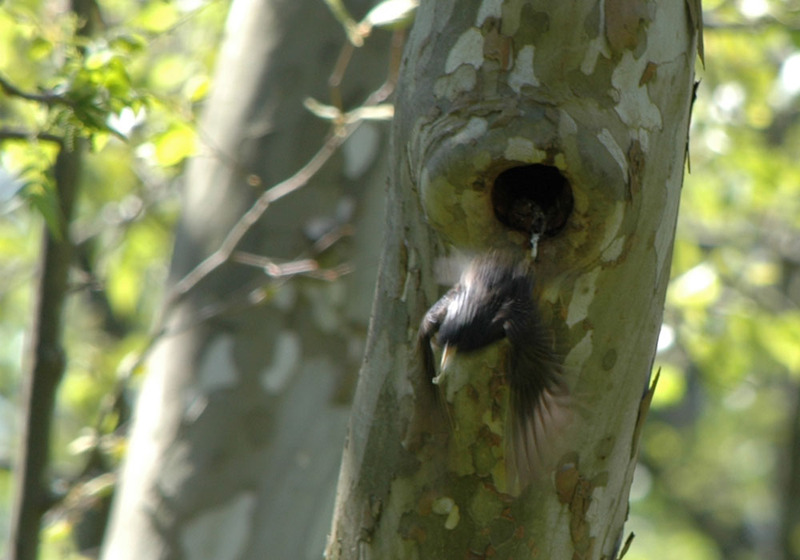 But the birds were singing and the mother wren and starling I’ve been watching were working hard making their seemingly unending round trips out to find food and back to the nest. I’ve tried to capture them with my still camera without much luck. Starling leaving the nest after feeding babies. 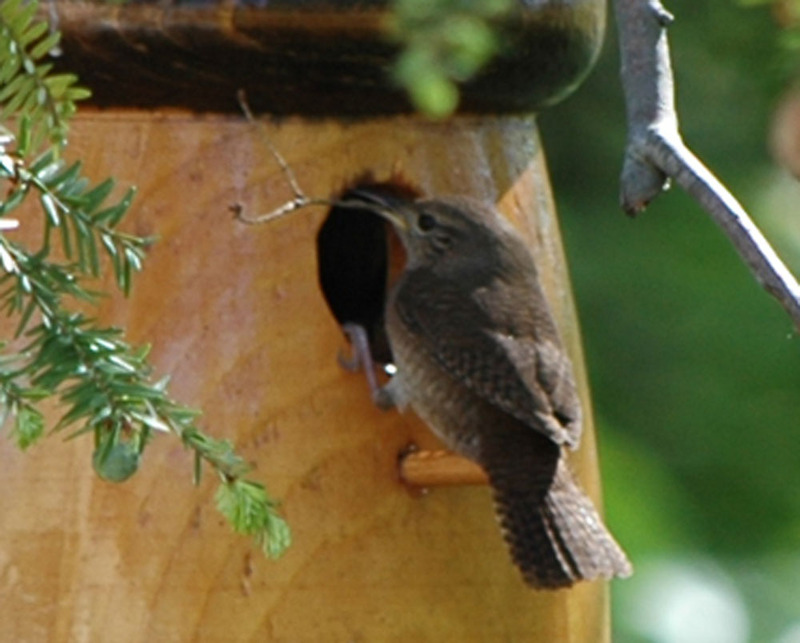 I had a little better luck catching the house wren. She’s carrying a twig in her beak for the nest, no doubt. I think she’s having a bit of difficulty getting the twig through the small hole. 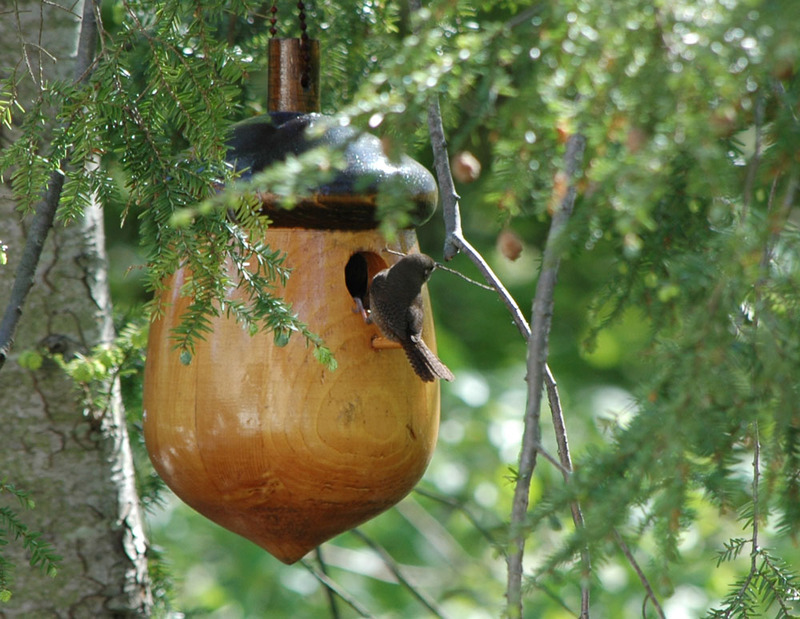 Earlier I thought the chickadees were going to nest in this birdhouse. I caught photos of a chickadee checking it out. Not sure what happened, but clearly, the house wrens are living there now. This first video is just a tad over 2 minutes. I edited it down from 18 minutes of shooting. 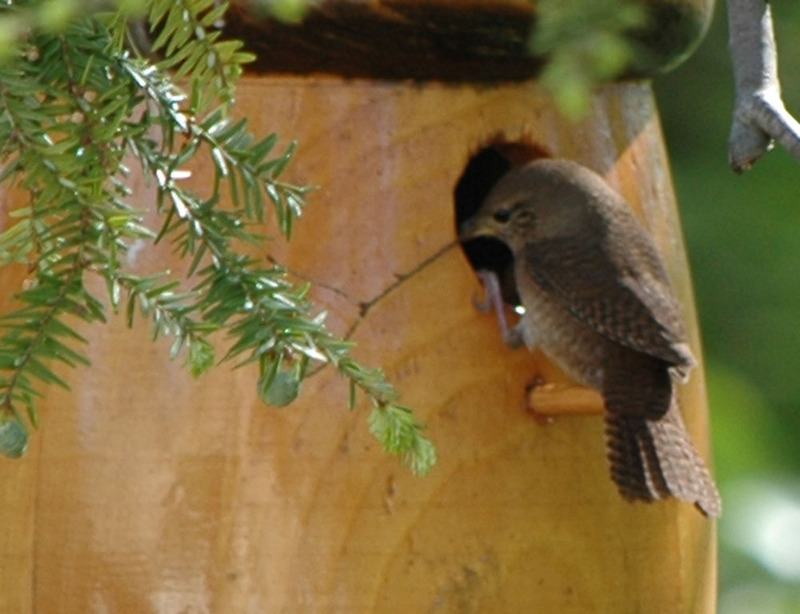 In that time, the adult wrens visited the nest 9 times, although the first two times were fly-bys. I think they were afraid because I was outside. At a couple of places in the video you can see one bird waiting on a branch while the other goes in to feed the babies. I thought I heard the adult call to the babies and then they answered. This is a 33 second video of a starling on her endless trek to and from the nest high up in a hole in the sycamore tree. A nest was here last year as well. I don’t know if there were more than one starlings feeding the babies, but I suspect there may have been. I tried to get a video of the robin, but I ran out of disc space and then the battery died. You don’t even want to know how long I spent video taping, editing, and posting these videos. If I told you, you probably wouldn’t believe it. If you did believe it, you would think, why in the world would she spend so much time on that? A question I frequently ask myself. And one of the reasons I haven’t promoted my book, updated my book bank account, or done any of those things that I read I should be doing if I want to be a successful and/or famous author. Oh. The robin’s back. And my camera’s charged. Gotta go.